Hootenanny News – FREE CD w/ ADV Tickets Purchase! Stay tuned for the schedule to come out this week! Meanwhile, if you purchase advance tickets (FRI-SAT or SAT ONLY) to the upcoming TDawg’s Back Porch Hootenanny on April 5-6, you will receive a FREE compilation CD from EITHER the Keel Family Function 2010 held at Cherokee Farms OR HarvestFest 2000 at the old Atlanta’s Back Porch in Fairburn, GA! Your Pick! Get it when you arrive at the Hoot! Lemme tell ya – you can’t go wrong here! I still listen to the both of them frequently they’re so good! Vintage TDawg music that will set your spirit free, at least for an hour or so 😉 We’ve had many great times over the years, and these two compilations are just a slice of the musical legacy we have created together as fans of the REAL music. 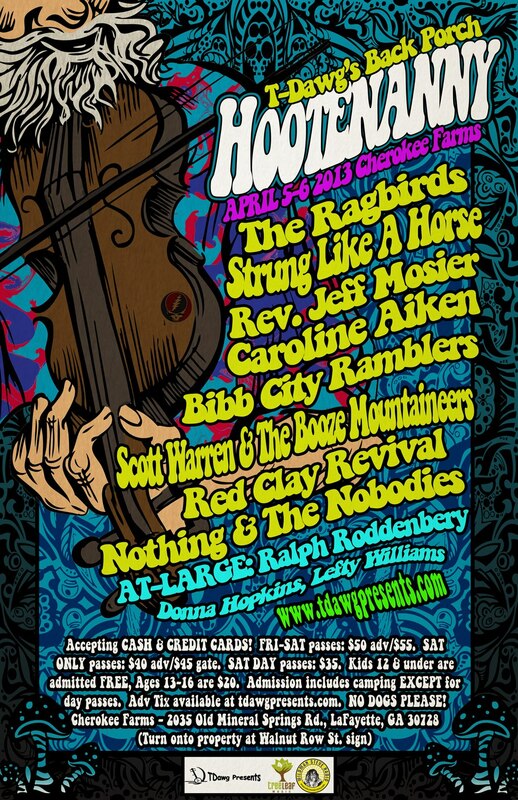 Visit the TDawg’s Back Porch Hootenanny page to get your tickets now! ← Benefit/Celebration at Sweetwater Brewing Co. tonite 2/26!